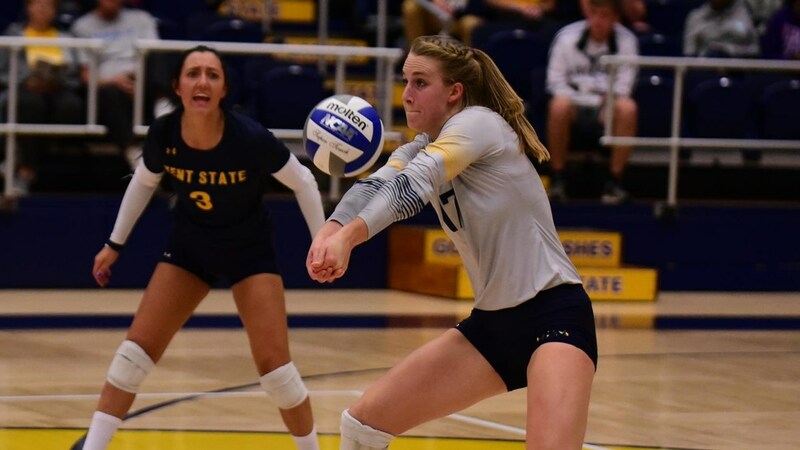 6’0″ tall outside hitter Kelsey Bittinger has become the first U.S.-born volleyball player in the history of the Kent State program to sign a professional contract after inking a deal to join PSVBG Salzburg in Austria. Kent State alums Liva Brivule (Latvia), Aleksandra Nowak (Poland), and Arjola Prenga (Albania) have each also represented the Golden Flashes at the professional level. Bittinger’s career at Kent State was filled with watershed moments. She was the first player in program history to earn three All-MAC First Team honors. She ended her career with 1,472 kills and 1,332 digs – which rank her as the 3rd-and-4th-best, respectively, in program history. She also excelled in the classroom, earning CoSIDA All-America Third Team honors in 2016, being named a 2017 Senior CLASS Award First Team All-American, and graduating with a degree in applied physics with a 3.95 cumulative GPA. She joins a Salzburg team that finished 7th out of 10 teams in the top-flight Austrian league last season. Salzburg has one other American on their roster, former Miami Redhawk Paige Hill, who is signed to return to the team next season after making Salzburg her first professional stop as well. Both players grew up in northern Ohio – Bittinger in Strongville and Hill in Massillon, which are less than one hour’s drive from each other.